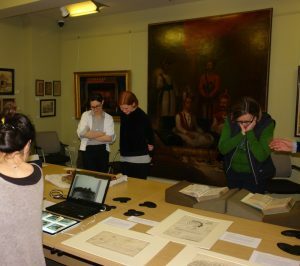 On Tuesday 26th March we held our third Collections Open Evening. It was a delight to welcome many people to view and hear about some of our Collections. 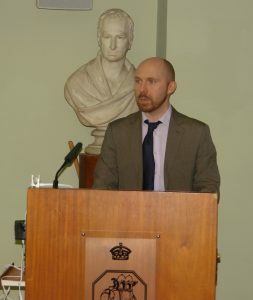 The evening was introduced by Edward Weech, RAS Librarian, who shared some of the initiatives which are currently being undertaken with the Collections. Librarian Edward Weech introduces the evening and its speakers. 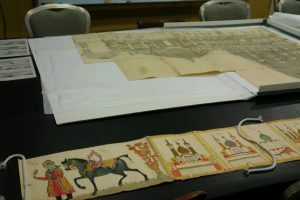 Our first speaker was Mathilde Renauld who spoke about the conservation work she undertook on a nineteenth-century Shia Islamic pilgrimage scroll. This intriguing work was in poor condition after having been kept rolled through the years. 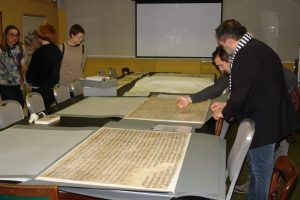 Mathilde detailed the problems with the scroll and how she set about stabilising the piece so that it is now accessible for future researchers. 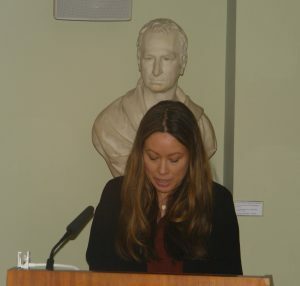 She also spoke on her investigations into the provenance of the object. 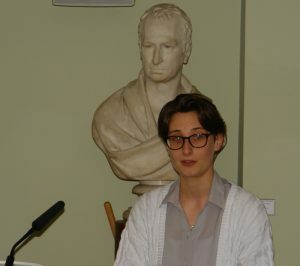 Mathilde completed the conservation as part of her MA course at Camberwell College of Arts and she very kindly came from her new post at the National Gallery of Ireland in order to take part in the event. The second speaker was Amy Matthewson, a recent doctoral graduate from SOAS. Amy volunteered at the Society working with our Collection of Glass Slides of China. Amy gave us an interesting insight into the history of glass slides before speaking more specifically about the context of the slides in our Collection. We are grateful for the time that Amy spent with these slides. They are the first of our glass slides to be catalogued and digitised. We have several more collections that need similar cataloguing and digitising which we are hoping to undertake in the future. Our final speaker was Laurent Cruveillier who discussed his conservation work with an 1850s ink rubbing and an inked squeeze of a stone inscription from Visvanatha temple in Khajuraho, India. These was undertaken under the command of Sir Alexander Cunningham and are of considerable rarity in that most of Cunningham’s papers were lost in a shipwreck. 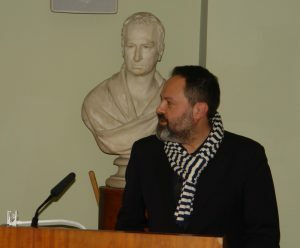 In the course of his research Laurent was only able to locate two others from Cunningham’s exploration which are currently housed at the British Museum. Laurent not only talked about his detailed conservation but also about the process by which an ink rubbing and an inked squeeze would have been produced. Laurent also undertook this project as part of his MA in Conservation at Camberwell College of Arts. This collaboration between the College and the Society is one that has been highly profitable to both the Society, in terms of getting material conserved to a high standard, and to the students , in having access to these rare types of material. We are very sorry to hear that the course will be closing. Laurent Cruveillier discusses the conservation of Sir Alexander Cunningham’s 1850s ink rubbing and inked squeeze of a stone inscription from Visvanatha temple in Khajuraho, India. We are very grateful to all our speakers who gave of their time, not only to work with our Collections, but also to prepare their clear and interesting talks. Our next lecture will be on Thursday 11 April, 6.30pm, when Dr Rayna Denison from the University of East Anglia will lecture on “The Hidden History of Studio Ghibli: Short Films, Advertising and the Industrial Reality of Japanese Animation”. We hope to welcome many of you to this event. In other news, it is with sadness that we announce the death of Michael Axworthy on 16 March 2019. Michael’s contribution to the work of the Society’s Journal will be sorely missed. His obituary from the The British Institute of Persian Studies, where he served as a member of the Governing Council, can be found here. Finally, we wish to apologise for the lack of notifications of new blog posts in recent weeks. There has been some ‘glitch’ with the website. We currently have IT experts working on it and hope that ‘normal service’ will be resumed soon.